Step outside this week into the chilly predawn to see the planet Mercury peak over the horizon. Then trace an arc across the sky to pick out Venus, Saturn, Mars and Jupiter. All five will be visible together for the first time since 2005. The latter four planets have been shining in the early morning since the beginning of the year. So writes Tanya Hill for The Conversation. "It is the appearance of Mercury that makes the family complete," she adds. You can take in the spectacle, depending on your location. Mercury usually hangs close to the horizon. It is the most difficult to see. But it will gradually cross higher in the sky and by early February it will be easier to spot. Starting January 28, the waning moon will travel along the line of planets, starting out at Jupiter and resting near Mercury by February 7. Venus and Saturn will dance in particularly close conjunction on February 9, report Bruce McClure and Deborah Byrd for EarthSky.org. 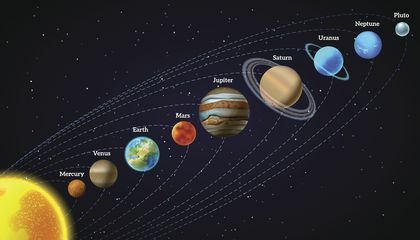 Since each planet orbits at different distances from the Sun and takes different periods of time to complete a year, this kind of alignment in the Earth's sky is rare. The fact that they do stack up in a line is visual proof that the planets do orbit on roughly the same plane, Hill writes. 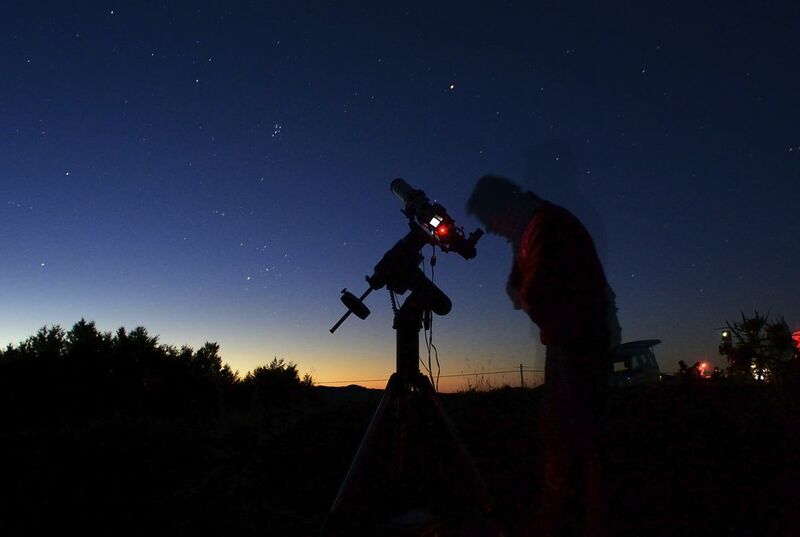 "There are only a few amazing things in the night sky that can be seen without any equipment," Alan Duffy, a research fellow at Swinburne University in Melbourne tells Anne Johnson of Australian Geographic. The planetary alignment is one of them, and worth an early rise. Duffy does caution that some people may have to travel farther than their front stoop to get an unobstructed view of the horizon. Trees, buildings, and city lights can all block the rare views. So make sure you prepare for the show. And figure out when Mercury will rise near you using the United States Naval Observatory's webpage. Hope for clear skies and bundle up. This may be the best view of the five planets aligned for quite a while. According to EarthSky.org, though the group will gather again in August, only those in the Southern Hemisphere will really get to see the next show. Why is no telescope needed to see these planets? This is really cool I might do that. I think there are other life forms in the universe. It is infinite so it would be rare if there wasn't anything else out there. For all we know our universe could be a little speck of another universe. Also, maybe in another galaxy other creatures live there too and they think the same that we do. I guess only time and study will tell. As long as Mercury is visible. we will be able to see the whole family of planets. This show is only visible in quite some time. The planets will eventually cross higher into the sky making themselves way more visible that anybody can see the show if you're around the location. I believe there is another possibility of any other type of life out somewhere else. we would have to do some ,ore deeper investigation. Anything is possible and we never know. Because they are going to come closer. In paragraph 1 it tells you that the planets are coming closer and we will be able to walk outside and see them.The moon will be close to the planets. There is no need for a telescope to see these planets because the planets don't need that a telescope to see them. Many people us them but you don't really need a telescope to see the planets. Many people don't have that much money to get a telescope so that's why now you don't need a telescope. Venus, Saturn, Mars and Jupiter will be visible together for the first time since 2005. I think that there is other life forms because there is one hundred billion galaxies and clearly we are not alone. The people might have not wanted to miss months on rare planetary alignment because people might have wanted to see the planets from the earth's surface which people can be able to see plants that are closest to the earth. The scientists might have been able to tell about what people that are actually seeing in the sky meant that the waning moon had been making people to be able to see other planets. The people might have been able to see planets with using any telescopes because people can be able to be seeing other planets that are far from them by seeing them with a naked eye. People might have seen other planets to be showing up by looking at them with a naked eye because people might have seen other things by looking at them by using a telescopes but people are seeing planets without using telescopes. Critical Thinking Question: Why is no telescope needed to see these planets? Answer: Because since the waning moon had made other people to be seeing close planets, people can be able to see them without using telescopes. I do not think there is life anywhere else in the universe but Earth because i don't think scientist discover any life on other planets. There is no telephone needed to see these planets because some can be seen in the night sky without equipment. You don't need to use a telescope to see the five plants, because they stack up in a line over the horizon. In this article it states that, "Since each planet orbits at different distances from the Sun and takes different periods of time to complete a year, this kind of alignment in the Earth's sky is rare." This shows that once in awhile all these planets line up, so you can see all of them at once. I think this article is interesting, because things like these don't always come around all the time, and people should take advantage and go see it.